The Nissan Serena e-Power packs engine, inverter and electric motor all together. The first e-Power system debuted in the subcompact Note. 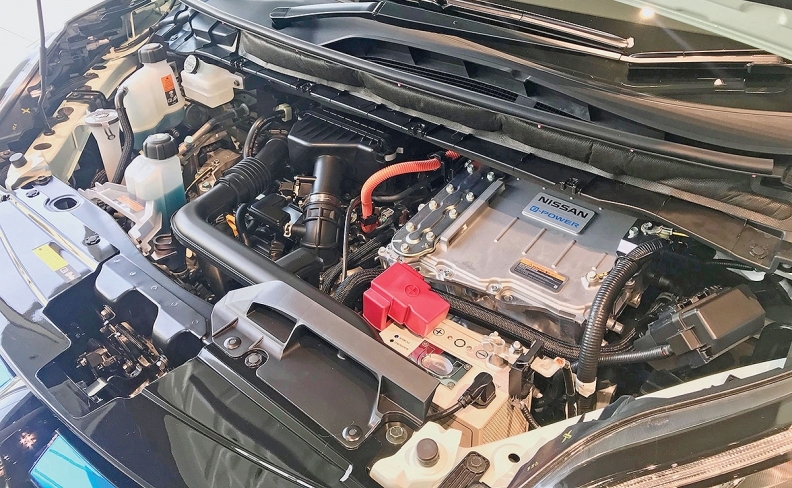 YOKOHAMA, Japan — Nissan has deployed its e-Power range-extender hybrid system to a second nameplate, with a beefed-up battery and motor that likely foreshadow a more robust version of the technology planned for the U.S. 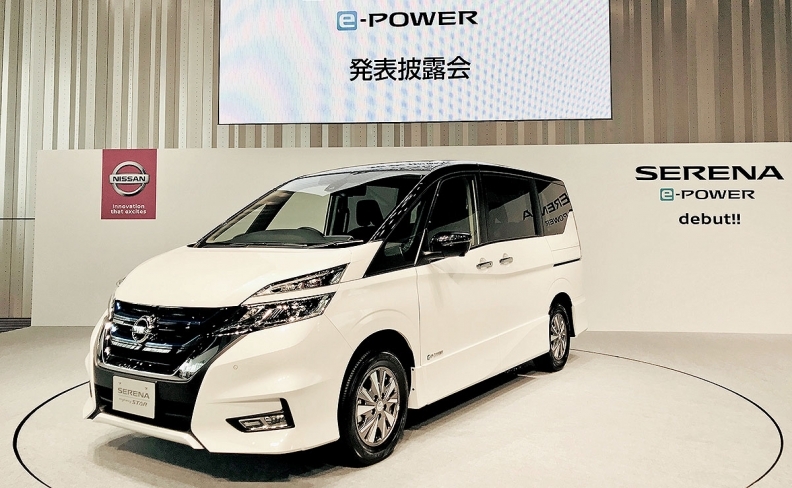 The latest e-Power system, introduced last week in the Japan-market Serena family van, churns out more power than the first iteration, which debuted in the subcompact Note hatchback in 2016. The Serena needed the extra oomph because the van is much heavier than the Note, seating two more people than the Note's five. That same thinking will apply when Nissan adapts the technology to large vehicles for the U.S., a powertrain engineer said. "Bigger motors will be necessary for Europe and North America for such uses as towing or ascending long slopes," said Ryuzo Noguchi, who worked on the Serena's electrified drivetrain. "U.S. market requirements are for large vehicles, so that is where we expect to apply e-Power." Nissan's global chief planning officer, Philippe Klein, told Automotive News that e-Power technology will make it to America as an option on high-end vehicles. Still unclear is when it will arrive and in which brands. But Nissan Motor Co. CEO Hiroto Saikawa said in January that the Infiniti premium brand will begin offering e-Power in the near future. The fuel-saving e-Power system is similar to that used in the Chevrolet Volt. A 1.2-liter, three-cylinder engine acts as an electricity generator that charges a lithium ion battery. The battery then powers an electric motor, which directly turns the wheels. Unlike the Volt, however, the Note e-Power cannot be charged with an external plug. The Serena e-Power offers a mode that allows 1.7 miles of quiet driving. The Serena e-Power, which went on sale in Japan last week alongside the traditional gasoline version, gets a 1.8-kilowatt-hour battery and a 100-kilowatt electric motor. That is a step up from the 1.5-kWh battery and 80-kilowatt electric motor used in the Note e-Power. The engine is the same but tuned to achieve 62 kilowatts (84 hp), over the Note's 58 kilowatts (79 hp). Noguchi said specifications of the U.S. version are still under study. But he speculated that a 130-kilowatt or 140-kilowatt motor would be needed stateside. Nissan might not necessarily need a larger battery, he said. But in that case, it may need to adopt an engine-generator more powerful than the petite 1.2-liter three-banger used in Japan. The whole system, from engine to battery and motor, should generate horsepower on a par at least with the 2.5-liter engine used in the Altima, he suggested. Because the Serena e-Power packs more punch, the system offers a new driving mode not offered on the Note e-Power. Called Manner Mode, it limits the amount of time the engine fires up to recharge the battery and allows the vehicle to cruise 1.7 miles in EV quietude. "You can come home quietly without waking up your neighbor," said Shuichi Machida, chief marketing manager for the Serena. "You can still hear the driver when sitting in the third row." E-Power saves fuel because it allows the engine to continually operate at its sweet spot to generate electricity, instead of revving up and down through RPMs to power the wheels. Indeed, the Serena e-Power achieves fuel economy of 62 mpg under Japan's testing regime, compared with just 40.5 mpg for the gasoline-only version. Besides being quieter than a gasoline engine, it provides the fun-driving, low-end torque of an electric vehicle. But unlike Nissan's flagship Leaf EV, e-Power is less expensive because it uses a smaller battery. The Leaf has a 40-kWh power pack and 110-kilowatt motor. In hybrid-crazy Japan, e-Power has been a surprise hit. The addition of the e-Power option catapulted the once-ho-hum Note to the country's No. 5 spot in last year's sales. About 65 percent of all Note buyers are opting for the e-Power package, the company says. Nissan expects to sell 96,000 Serena vans a year in Japan and thinks 40 percent of them will be e-Power variants.